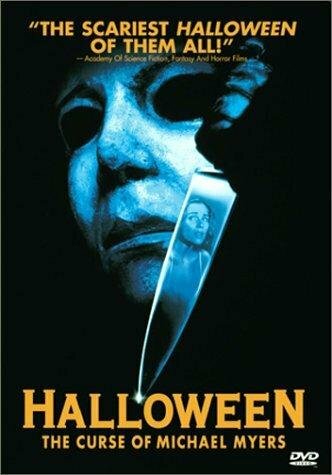 Halloween: The Curse of Michael Myers (1995 / Theatrical Cut) is my all-time favorite Halloween film, and one my most favorite horror films overall. As I've gotten older and more deeply interested in film past superficial viewing and as DVD technology came into existence I became much more interested in learning about the films I loved as a child, special features, alternate versions and so forth. For me, the holy grail, the most elusive of all special cuts of the films I've loved, for years, has been Halloween 666: Producer's Cut, and almost 20 years later, it's finally here. I distinctly title it differently from the theatrical release, because to me, this isn't merely an alternate version, it's an entirely separate movie. If the Producer's Cut finally getting a proper release wasn't exciting enough (I personally think it's the biggest news of all), we're also being treated to a complete box set of all ten Halloween films, together for the first time, with new (and old) special features and several alternate cuts. This set is only possible due to a collaboration between Anchor Bay and Scream Factory. 10-disc Edition - Includes the theatrical cuts only of all ten films with select bonus features. SRP is $129.99. 15-disc Deluxe Edition [the only one worth buying in my opinion] - Includes the theatrical cuts of all ten films, plus the never before released Producer's Cut of Halloween: The Curse of Michael Myers, the network TV version of the original Halloween, the network TV version of Halloween II and the unrated versions of Rob Zombie's Halloween and Halloween II. Brand new bonus features, including new interviews with cast and crew from the entire franchise. The original Halloween will now also include the original mono audio track and the set will include both versions of the original Halloween - the original Blu-ray release and the recently remastered 35th Anniversary version with the mono track added back in. It also comes with a limited edition 40-page book written by Michael Gingold of Fangoria Magazine. The collectible packaging will include a newly commissioned illustration on the outer case and each film will be in its own black Blu-ray case with the original theatrical one sheet as the key art. SRP is $169.99 [Amazon listing currently set at $109.99]. Anchor Bay Entertainment and Scream Factory proudly announce the bonus features and technical specifications for the September 23rd HALLOWEEN Complete Collection Blu-ray™ set. This new set boasts a wealth of NEW bonus features including 7 brand NEW featurettes, 3 brand NEW commentaries, 4 brand NEW interviews – with many of the participants sharing their thoughts about the franchise for the first time -- and NEW transfers and audio specs on selected titles. Featurette: "The Many Faces Of Michael Myers"
In other related news, an officially licensed Halloween 6 Michael Myers mask is now available for pre-order (already ordered mine) here.